Last weekend I decided to go camping. I hadn't been in a while, but since I got the canoe on the go, I figured I might as well go a step further. 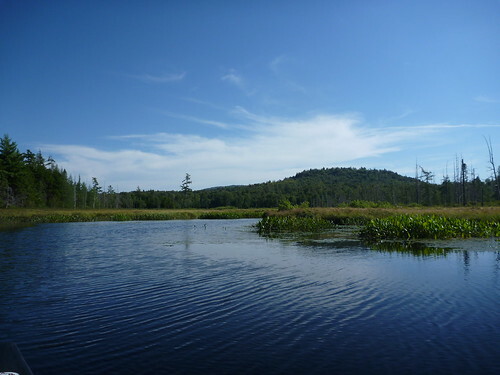 I basically spent the week beforehand trying to figure out where to go, and finally decided to head up to 'Little Tupper Lake' which is about 3h northwest of Albany, in the Adirondack's. Specifically, there was a little pond off a river you can reach from the South side of the lake, and that was my goal. After buying a bunch of stuff I needed (and a bunch of stuff I didn't really need), and getting it all packed into my biggest backpack, I headed out Saturday morning around 10:30. It was a little later than I wanted to leave, but hey, it was the weekend. The drive up was pretty uneventful. The roads were good all the way, and I was surprised at how built up the park was. 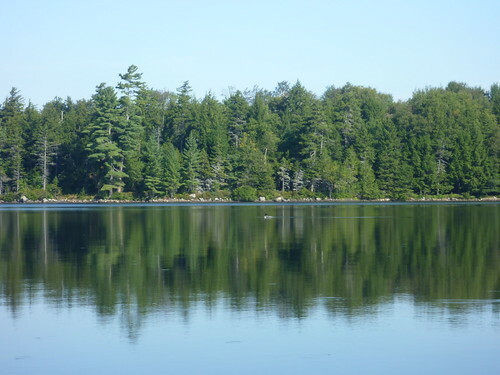 I guess I was expecting something closer to Algonquin Park (where I grew up) where basically the only thing you pass between the East and West gate's is trees and lakes. The road I was on basically felt like any normal rural road in Central Ontario, with towns every so often and lots of houses - not at all what I expected from a park. By the time I got to the lake, I was getting a little worried: there were lots of cars parked in the parking lot and it was much busier than I expected. After taking everything out of the car, checking to ensure I didn't have any horses with me, and signing in at the ranger station I headed over to the water. 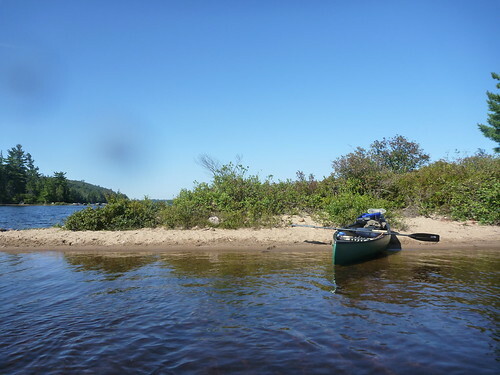 The launch point was a little sandy beach just off the parking lot, which was pretty nice. 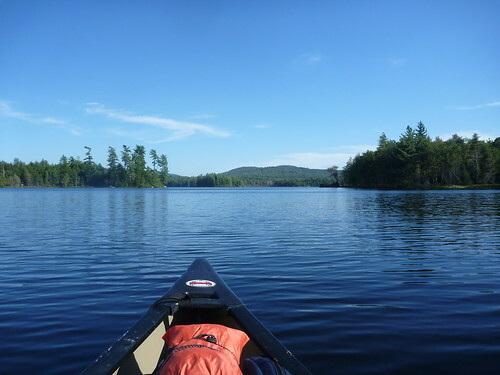 Everything I had in the canoe, I headed out. The launch is sheltered a bit from the main lake, which is angled pretty much parallel to the prevailing winds. This means that at first it was pretty easy going (I was following a small group of kayakers that launched about the same time as me). Once you round the point though, what felt like a gentle wind turned out to be enough to kick up some good sized waves. Nothing too serious, but the occasional 1ft wave was enough to keep my guard up. After fighting the wind for a while, I decided to head to the other side of the lake (where there was more protection from the wind). It was a little better over there, but if I stopped paddling for a second the wind would quickly push my little canoe the other way. There were a few interesting things to see, a big beaver lodge, some nice little bays to take a rest in and some islands. At the south end of the lake there was a little river through a marshy area that headed down to Rock Pond, where I wanted to make camp. 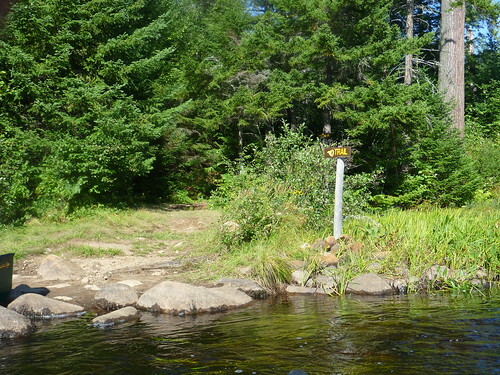 After crossing a few beaver dams there was a short portage to Rock Pond. While putting my canoe in on the other side, some kayakers stopped to talk. They asked if I was planning on camping on the pond, and warned me that they had never seen it so busy. Terrified that I might not find a spot, I sped up loading the canoe and decided to take the first place I could find. 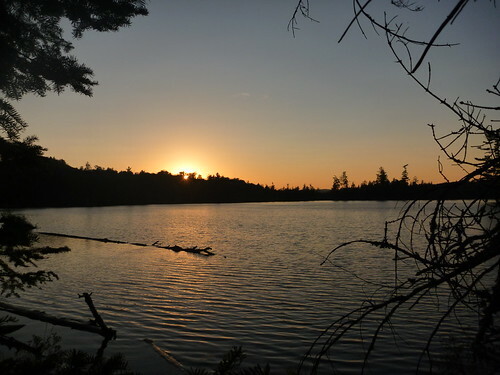 After checking my map (it had the campsites on the lake marked) I hurriedly paddled into the pond. I passed a few campsites with canoes visible before spotting one (behind a couple of guys fishing from their canoe) that looked empty. Success! Breathing a sigh of relief I pulled up my canoe and unloaded my stuff. First off, I had to hang my food-bag the last thing I wanted was to be worrying about a bear sneaking up behind me because I was too lazy to store my food properly. I found a big pine with a long branch and hung the bag before heading back to the campsite. Next up, I set up the hammock. I'd never done it beforebut I was surprised, how easy it was. I chose a poor spot the first time however, and I had to move it to some trees that were further apart so I could get the rain-fly on. It was super-comfortable to sit in (without the rain-fly) and I'm extremely pleased with it. Next order of business was to get some wood for a fire. It was getting on in the afternoon and I had to hurry if I wanted to have enough before dark. I grabbed a bunch of fallen logs (there was a ton of brush around to choose from) and set about cutting fire-pit sized pieces. About 1/2 way through the 4th cut, my hand-saw broke. I was more than a little angry since it was brand new (though, it was pretty cheap - still I expected more). I continued to use the broken saw to cut enough wood to last for a while, and decided it was time to make some dinner. Then it was back up the hill for some dinner! 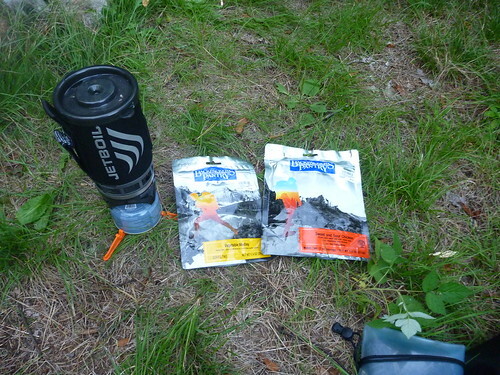 On the menu: some dehydrated veggies and sweet and sour chicken. Overall, it wasn't bad. Both were a little on the 'soupy' side, but after a long day of paddling I wasn't complaining. While I waited for the food to cook I got a fire going. 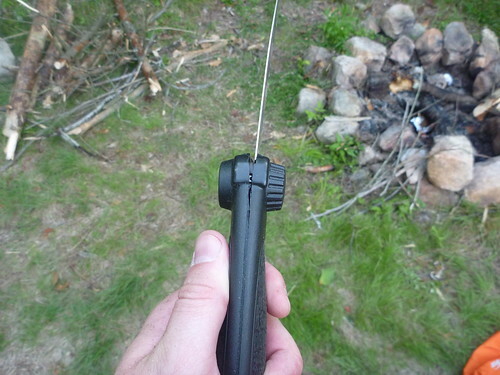 I tried using the firesteel I brough with me (just to see how it worked), but didn't have much luck and resorted to my lighter to get it going. 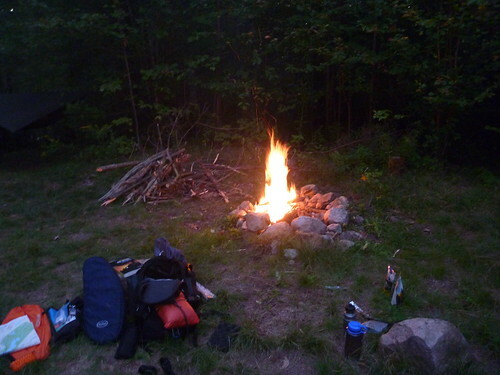 By the time the fire was going strong the food was ready to eat and I kicked back and relaxed on one of the rocks nearby. It wasn't long after dinner that it was properly dark and I decided to break out the Uke. I basically only played for a few minutes before I realized that the whole lake could probably hear me, so I stuffed it back into the bag and went about getting ready for bed. Earlier getting the hammock setup (hung) was super easy. It turns out, it's much harder to actually get everything IN the hammock setup in a comfortable way. At first I tried putting my sleeping pad in the compartment that hangs below the hammock - which was a design feature in the model I got. It was pretty hot (I was sweating just standing around) and so I decided to just lie in the hammock. That went pretty well for about an hour, until it started to get colder. I decided to grab my sleeping bag. I never realized how hard wiggling into a sleeping bag while dangling in the air and trying to stay on top of a slippery sleeping pad (that you can't actually grab because its on the other side of the hammock fabric) could be. After a lot of squirming and turning I had enough and decided to just cram the pad directly into the sleeping bag. It turns out, that's what I should have done in the first place - the sleeping bag I have was designed for it (it's got a little flap on the back with velcro that lets you slide the pad into a pocket that runs the length of the bag) and it kept the pad under control while I got in. After discovering the trick to moving around in the hammock is to reach out and grab the ground to get leverage, I finally fell asleep. The sleep itself was excellent. I was warm, comfortable, and even managed to roll around and sleep on my side a little bit. I do not ever remember being that comfortable sleeping in the ground on a tent (I always end up jamming my hip into the ground since I like to sleep on my side). It took some getting used to hearing the sounds of the woods again (damn frogs jumping around in the leaves had me very confused for a while). In the morning, I decided to head out pretty much as soon as I got up - which was pretty early (since I'd gone to bed so late). I had two reasons: I didn't want to be too late getting home and (most importantly) I wanted to make it a good way down the lake before the wind picked up. I didn't like the idea of having big waves coming at me from behind while I paddled. I made some (terrible) dehydrated eggs for breakfast (next time I'm bringing real food), packed everything up, and headed out. I was the first person on the pond, but I could hear some others waking up as I left (cracking wood for a fire). It was extremely calm as I paddled back, which was really nice. 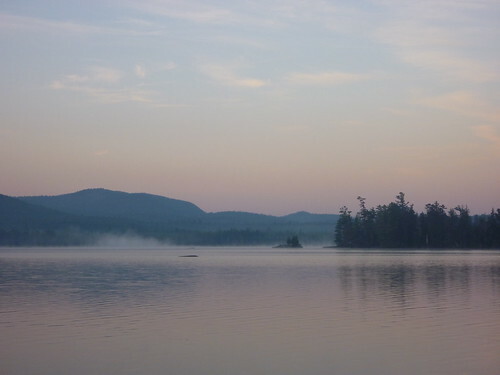 I really love camping in the early morning, when everything is still and calm and the water is like glass. 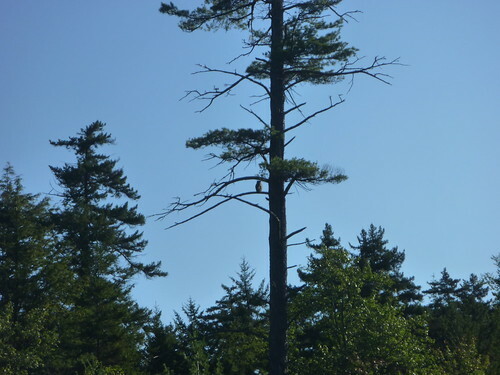 I even managed to spot an owl in a tree along the river. When I hit the main lake, it was equally serene. There was noone around yet (except me and the loons) and it was a beautiful paddle - well worth the trip just for that morning. The wind began to pick up as I travelled back, but it was behind me which let me take it easy. 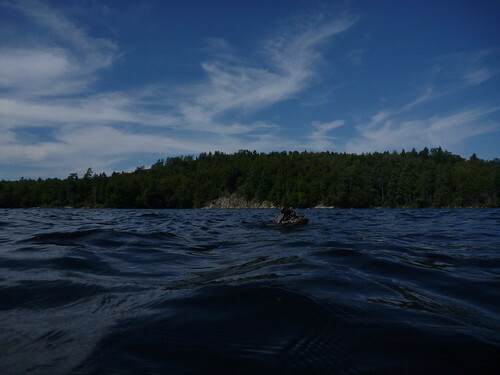 I stopped for a quick swim about 3/4 of the way back at a little island with a sandy beach. It was quite nice and refreshing. After that I was pretty much back at the launch point - and it was back to civilization. Get there early. I pretty much had to rush from when I hit the water until I had dinner in order to get all the way down the lake and get camp setup. It would have been nice to have some more time and a little more relaxing paddle. 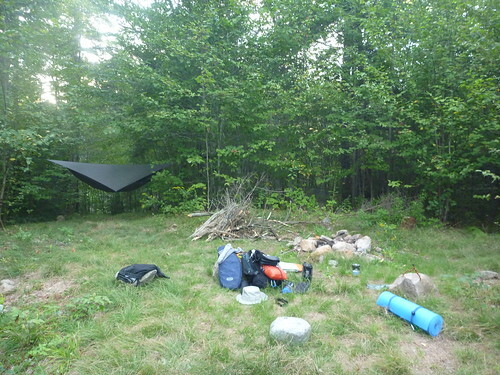 Choose a more remote location, or one with better camp site spacing. There were too many people clustered around the little pond for my liking. 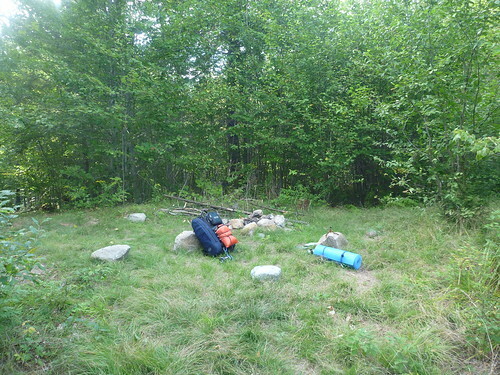 If I would have been staying another day, I probably would have gone back to Little Tupper lake to grab a camp site that was a little more private. Use the Kayak paddle against the wind. 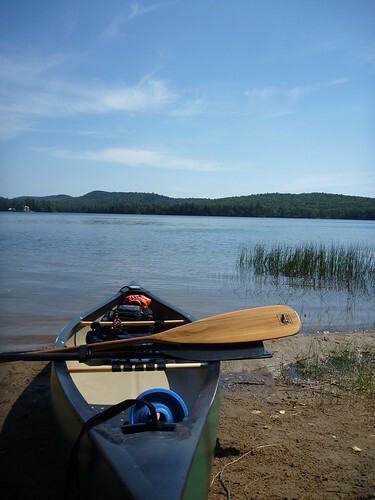 I used my canoe paddle the whole way down the lake (against the wind). Since I'm going solo, I have to do a lot of correction to go in a straight line which means the wind slows me down a lot more. 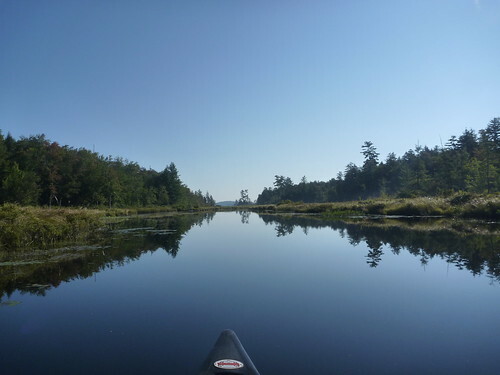 The kayak paddle is much better at this kind of open-water paddling. I should have saved the canoe paddle for the river at the end. Get a waterproof backpack. The kayak paddle splashes a lot of water into the canoe. So can the waves. It would be awesome not to have to worry about that all the time. Get a map case. I had to keep pulling out the map and unfolding it to check my progress. It's extremely annoying in the wind. I should just get a case I can tie to the thwart and have it handy all the time. Don't skimp on the saw. It broke after 10 minutes of use. Next time I'll do more research before buying one. Don't forget sunscreen (even in the morning). I have an awesome life-jacket shaped sunburn on the right-side of my body (from the eastern morning sun). Classy. Get some real rain gear. It didn't rain at all (it was fantastically sunny) but if it had, I would probably have been pretty miserable with only my crappy semi-waterproof jacket. For a trip this short - leave the uke at home, bring a book instead. I was tired by the time everything was ready at the camp. Also my fingers were tired from snapping branches, tying knots and holding my paddle all day. I played for all of 5 minutes. A book would have been much more relaxing and easier to bring. If I had another couple days it might have seen more use - but not on a one-night trip. Real Food. I need a real (bearproof) food container and some non-dehydrated meals. More soups (that are supposed to be soup - not 'bacon and eggs soup') and tea. I really wanted a hot drink in the evening. That's it! All in all, it was a fantastic trip. I can't wait to do another one like it. Tomatoes, sausages, nice crispy bacon.